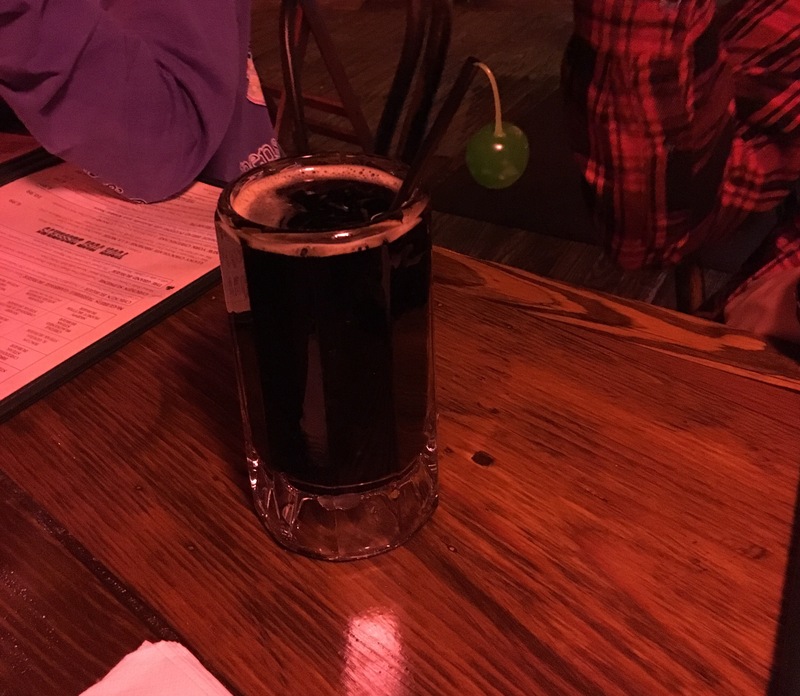 Our oldest loves root beer, and McGuire’s makes their own in-house brew. It is not like your average store bought brand. 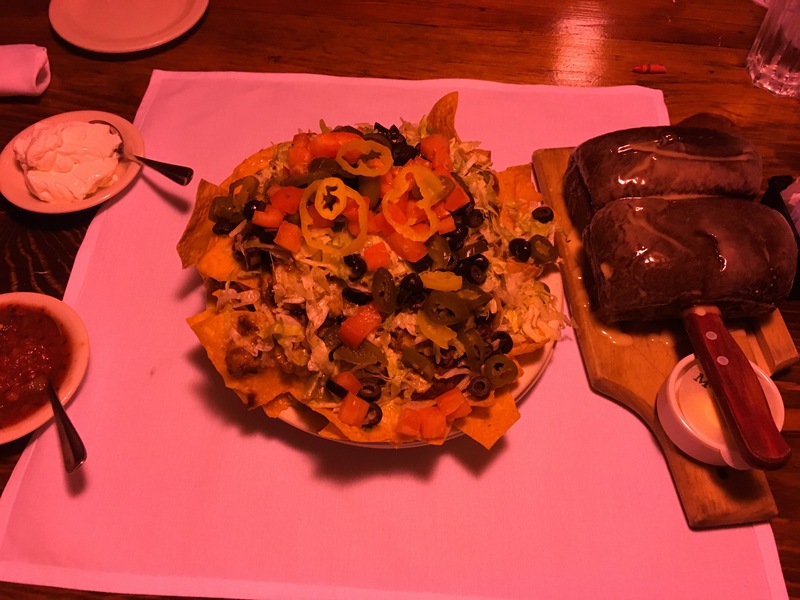 This was yummy, topped with its own “green cherry bomb.” Among our party of nine, we ordered the fish and chips, burgers, popcorn shrimp, steaks, and salads. Everything was great, but by far, the absolute best thing was the steak and baked potato. Oh my goodness, the steak was so tender, you could cut it with a dinner knife (not steak knife)! It was soooo delicious! My husband got this as his meal, and I had wished I’d gotten that instead of my burger. The baked potato with which it was served was cooked perfectly, just as if it had been timed exactly right to sit over a campfire till it arrived at perfection. I was really glad my husband was so full from the nachos, bean soup and bread; so, I could enjoy a few bites. 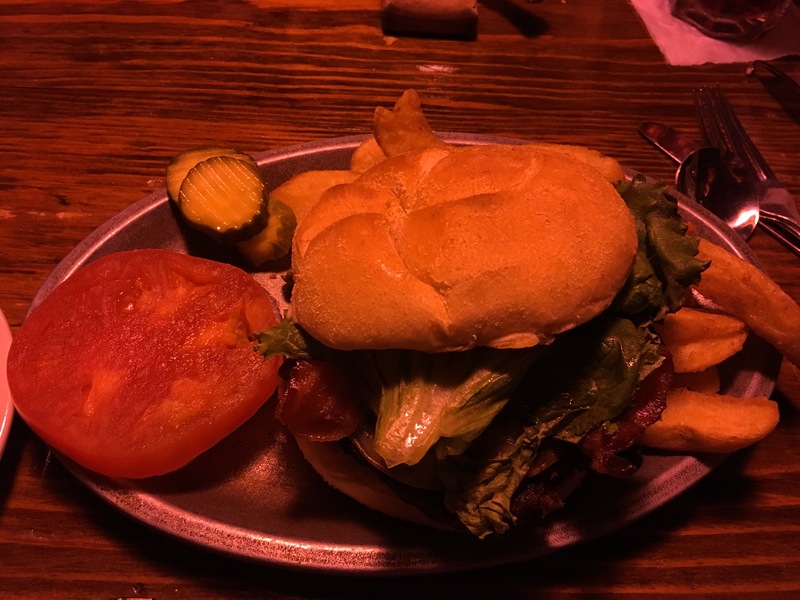 My burger, complete with bacon, smoked gouda cheese and lettuce, was huge and very tasty…too much to finish but very good. The fries were not too thin, not too thick and yummy. The sweet tea was perfectly Southern style, and the coffee was hot, but maybe not my first choice. Since, the Irish are well known for their “drink and be merry” moto for life, if you’re into ales and such, they’ve got plenty of those from which to choose, and they even have some homemade brews. I’m sorry, I’m not into All that; so, I could fill you in on that part. 😉 They’ve, also, got “The Grand Burger” which they serve with champagne, and a “Garbage Burger” with all that you could think of on top, not really either of my choices in burgers, but hey, to each his own, I suppose. Because we were all absolutely stuffed, we didn’t even think about dessert, but they do have a few. However, I can’t rightly remember what those might be. They’ve also got an Irish gift shop right next door, complete with all kinds of Irish gift items, as well as, a pizza shop and other Irish adorned shops along the little strip (*This is all at the Destin location). Finally, it might seem very strange to include the “bathroom signs” on a restaurant review; however, I thought it important to warn you that when you are at McGuire’s, you need to be sure to read these signs very carefully. Otherwise, you might get quite a surprise…LOL! 😉 When I’m on the Gulf Coast, it is hard for me to bypass the great seafood for a different cuisine; however, McGuire’s is worth the trip, and we will definitely be going back! To check out their website for locations and menu items, click here. Yum! That looks delish! Wish I was in the area so I could give it a try. Maybe next time I am on holiday. Either way, I like reading your restaurant reviews. 🙂 Thanks for sharing. Thanks so much! I’m glad you enjoy these. 😊Thanks for reading.